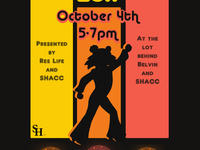 Join the Student Health and Counseling Center (SHACC) and the Department of Residence Life at the Disco Fever Block Party on Wednesday, Oct. 4 from 5–7 p.m. Come learn about the great resources SHACC has to offer and enjoy food, games, music, and giveaways. Free t-shirts and other items will be given to students at the event (while supplies last). For more information, about this event, please contact the SHSU Counseling Center at (936) 294-1720.